Histogram Borders - control over bin size? 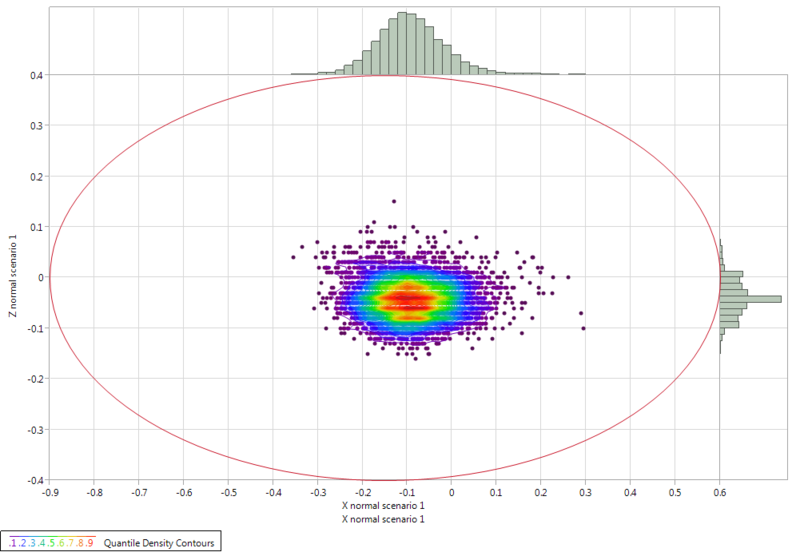 I have a graph of a bivariate fit of 2 variables to which I have applied Histogram Borders (image attached). The help pages give no information with respect to controlling the bin sizes of these. Of the various options applicable to ordinary single variable histogram graphs, only the Grabber tool seems to be available for Histogram Borders. Unfortunately, this tool is imprecise and I can’t get it to quite do the business. I’d like to have equal width bins for both axes (as they share the same unit) and sensible upper and lower thresholds for each bin (i.e. starting/finishing at round numbers). Any ideas how to control this? Re: Histogram Borders - control over bin size? The histogram borders in Fit Y by X inherit their bin sizes from the axes themselves. To change the bin sizes you can double click each axis and change the "increment" to whatever bin width you need. If you wish to have fewer labels on the axis but want smaller bins, you can use the "# minor ticks" to reduce the bin size by a factor of whatever you specify. You can also change the min/max for each axis, which can control where your bins' start and stop. Thanks for that. Works a treat.